0 Comments Published by KL Ocs Kid on Thursday, July 26, 2007 at 10:07 AM. 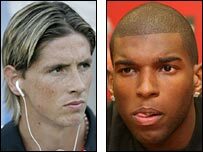 Liverpool boss Rafael Benitez hopes to solve a red tape wrangle that has prevented new boys Fernando Torres and Ryan Babel playing in the Asia Trophy. They did not face South China in Hong Kong because Liverpool had been unable to gain international clearance. Benitez wants the problem solved before Friday's final with Portsmouth. He said: "It is clear the matter caused us a problem because we ended up with Sami Hyypia in midfield. Hopefully we can find a solution so they can play." Benitez also believes captain Steven Gerrard will be over his stomach ailment and be available to lead a Liverpool side that attracted a capacity 38,000 crowd to a Hong Kong Stadium which had been just over half-full for Portsmouth's win over Fulham. Although they hit the heights only sporadically, Liverpool were far too good for their hosts, with John Arne Riise responding to the speculation over a move for Gabriel Heinze in the perfect manner. The Norwegian smashed home a spectacular free-kick to put the Reds in front. Now Benitez wants Riise to produce that kind of form when the Premier League starts in a fortnight. "John has made a really good start to pre-season," admitted Benitez. "But this is only the practice. If he can start scoring goals like that in the Premier League that really would be perfect."